Since the mid-1980s, forecasts of tropical Pacific SST anomalies have been made regularly at LDEO with a simple coupled ocean-atmosphere dynamical model (Cane et al., 1986; Zebiak and Cane, 1987). This model has played an important historic role in our understanding and prediction of ENSO. In the mid to late 1990s, we have improved the original LDEO model considerably by using a more balanced forecasting scheme (Chen et al., 1995), by applying more and better data for initialization (Chen et al., 1998, 1999), and by effectively reducing the large systematic model biases (Chen et al., 2000). The forecasts presented here are from the latest version of the LDEO model (LDEO5, Chen et al., 2004). In its present setting, the model is initialized by nudging observed SST (Climate Analysis Center), wind (Florida State University and National Centers for Environment Prediction) and sea level (University of Hawaii) anomalies into the spin-up run. Satellite derived products, such as the sea level data from TOPEX/POSEIDON altimeter and the wind data from NSCAT/QuikSCAT scatterometer, have also been used for model initialization since they became available. 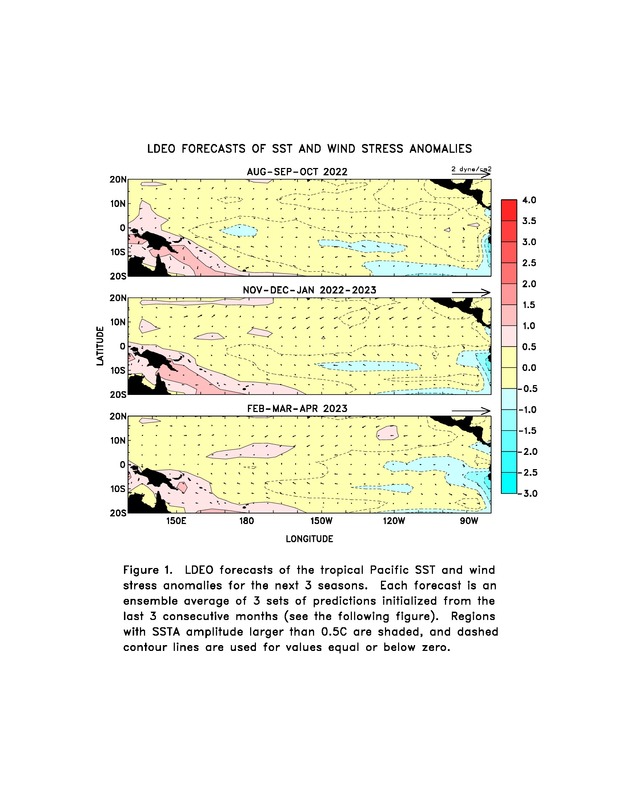 Figure 1 shows model predicted SST and wind stress anomalies in the tropical Pacific for the next few seasons. These are ensemble averages of the forecasts started from the last three months. A closer look at the forecast integrations for NINO3 (the average SSTA in the region 90W-150W, 5N-5S) is provided in Figure 2, which shows individual 9 month forecasts beginning from 1-month-apart initial conditions. Cane, M. A., S. E. Zebiak and S. C. Dolan, 1986: Experimental forecasts of El Nino. Nature, 321, 827-832. Chen, D., S. E. Zebiak, A. J. Busalacchi and M. A. Cane, 1995: An improved procedure for El Nino forecasting: implications for predictability. Science, 269, 1699-1702. Chen, D., M. A. Cane, and S. E. Zebiak, 1998: The impact of sea level data assimilation on the Lamont model prediction of the 1997/98 El Nino. Geophys. Res. Lett., 25, 2837-2840. Chen, D., M. A. 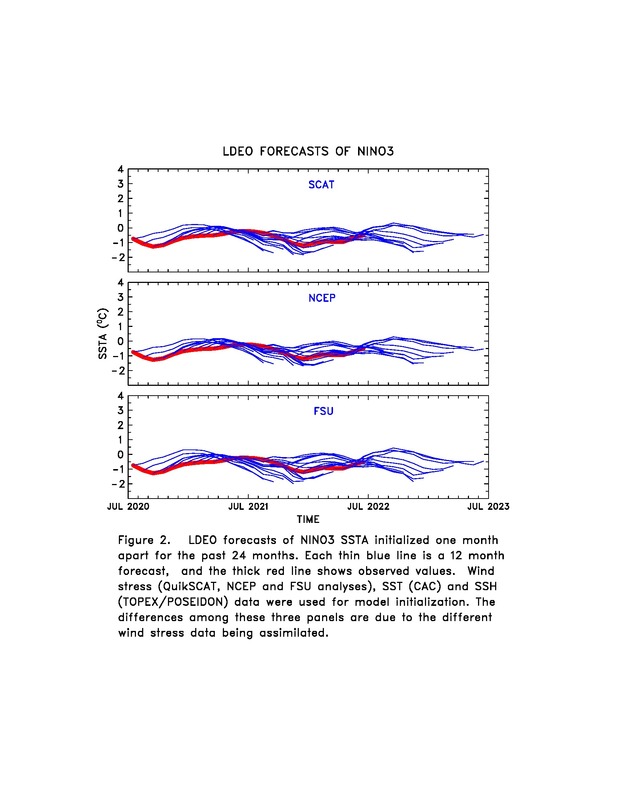 Cane, and S. E. Zebiak, 1999: The impact of NSCAT winds on predicting the 1997/98 El Nino: A case study with the Lamont model. J. Geophys. Res., 104, 11321-11327. Chen, D., M. A. Cane, S. E. Zebiak, Rafael Canizares and A. Kaplan, 2000: Bias correction of an ocean-atmosphere coupled model. Geophys. Res. Lett., 27, 2585-2588. Chen, D., M. A. Cane, A. Kaplan, S. E. Zebiak, and D. Huang, 2004: Predictability of El Nino in the past 148 years. Nature, 428, 733-736, 2004. Zebiak, S. E. and M. A. Cane, 1987: A model El Nino-Southern Oscillation. Mon. Wea. Rev., 115, 2262-2278.